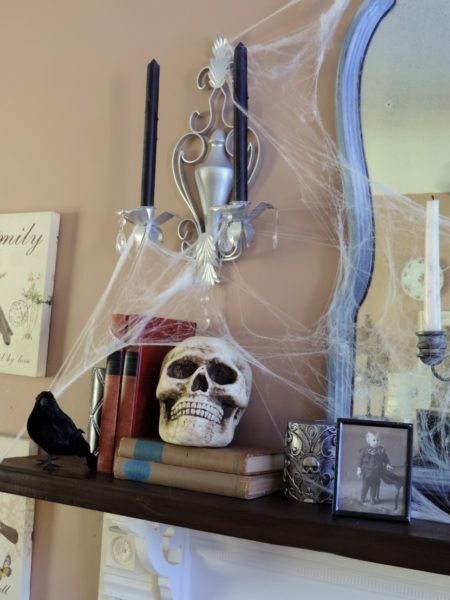 With Halloween just around the corner I wanted to share with you my Haunted Library Inspired Halloween Mantel. I had a lot of fun decorating my mantel this year. When I think of a Haunted House I immediately think of a creepy library in a spooky old mansion filled with old books and cobwebs. I took this idea and ran with it. Take a look…. I started by gathering a bunch of old vintage books that I had around the house. I love incorporating books, especially vintage ones, in my decorating endeavors. 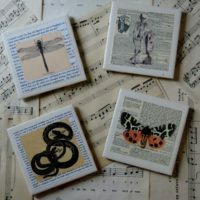 The books were displayed in various locations on the mantel and floor. 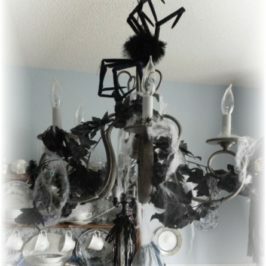 The existing candles in the sconces were swapped out for for black ones. 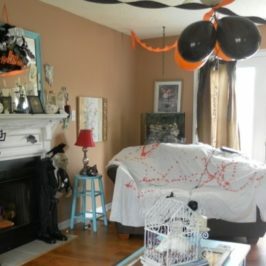 A few accessories were tucked in here and then cobwebs were stretched over everything. 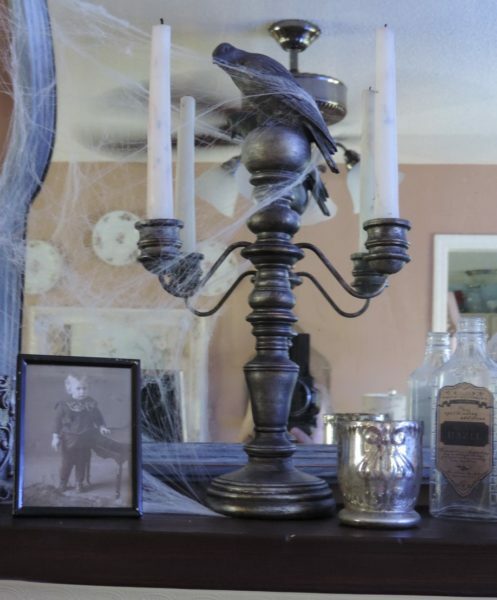 A haunted library would not be complete without a skull and some potion bottles. 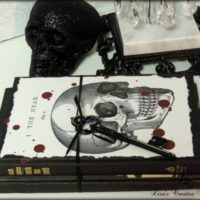 This skull looks great sitting on top of a pile of books. I found him at my local Michael’s Craft Store . 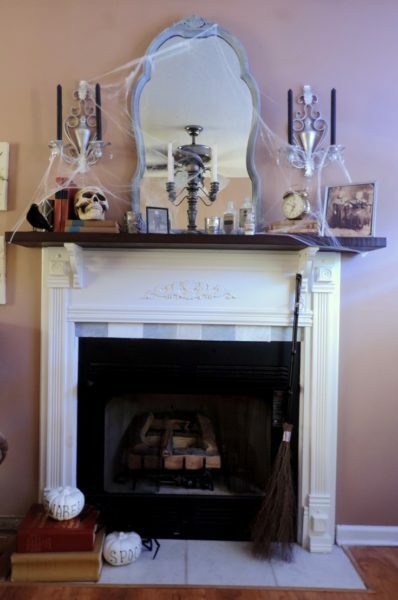 I had in mind that I wanted to do my mantel in a haunted library theme for months. When I found this candle holder at a local consignment shop I knew it would be perfect. 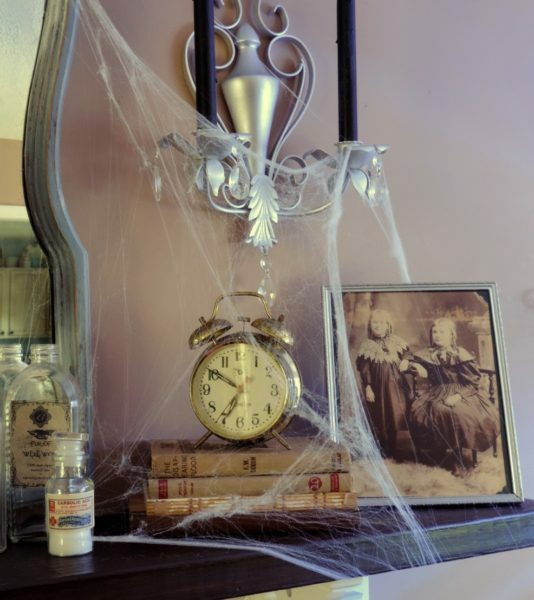 A few creepy framed photographs add interest and authenticity to this Haunted Library Halloween mantel. I found the images by surfing the internet and had them printed at my local Walgreens. I can just imagine someone sitting in the chair beside the fireplace reading by candlelight on a stormy night. 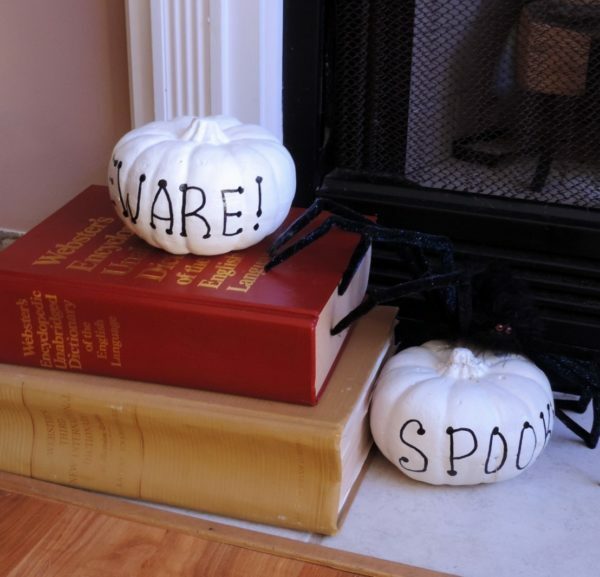 Two very large vintage dictionaries embellished with white pumpkins and a spider sit at the base of the fireplace. A witches broom is displayed on the opposite side. One of my pillow creations sits on the chair. 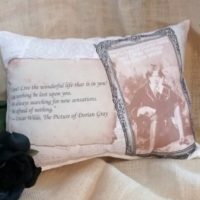 I love the story of Dorian Gray and designed this pillow with images of pages and quotes from this classic story. 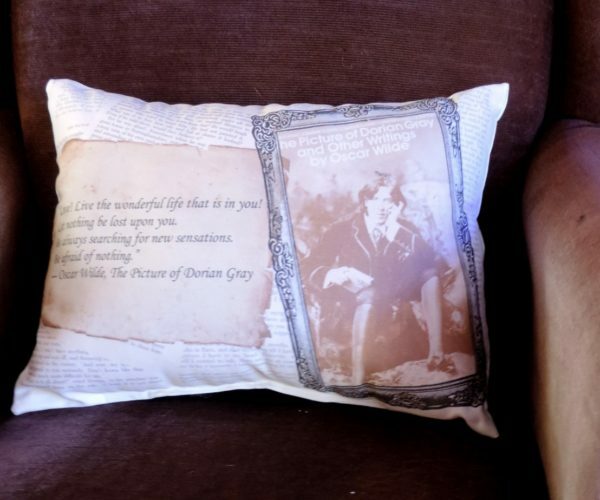 So, this Picture Of Dorian Gray Pillow fits in with the haunted library theme perfectly. So there you have it folks! 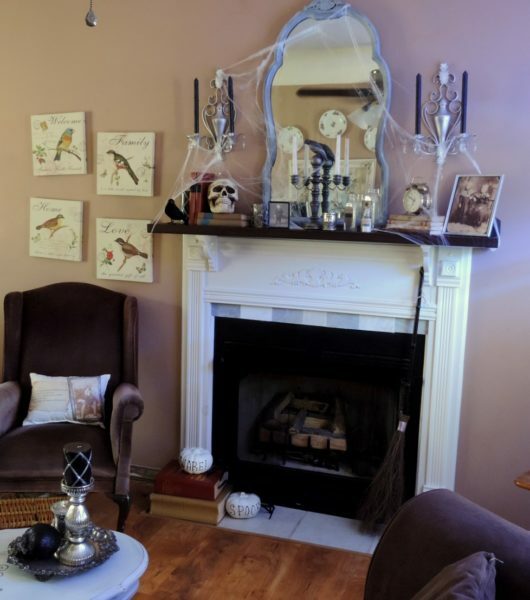 What do you think of this year’s Haunted Library Inspired Halloween Mantel??? You can easily create this look on your own. 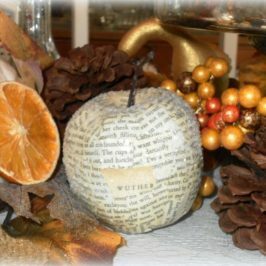 Shop for vintage books, candle holders and picture frames at local thrift stores and consignment shops. 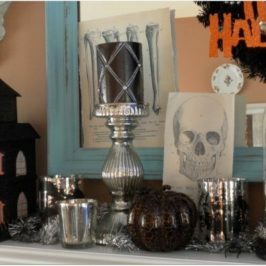 Paint the candle holders black or dark gray. Make your own potion bottle with recycled or vintage bottles by printing out the labels on your computer. 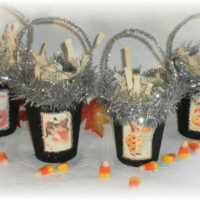 You can get spooky label images and instructions on how to make your own Poison and Potion Bottles here. 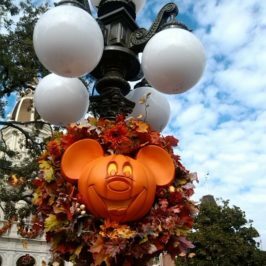 You can get the other Halloween items like the birds and skulls at any discount or craft store starting in September. 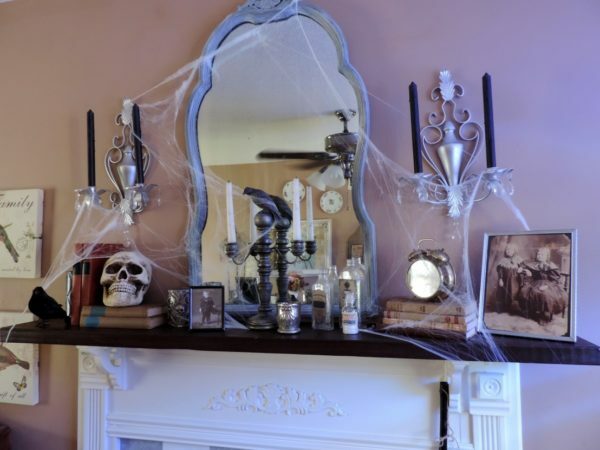 If you create your own Haunted Library mantel I would love to see some pictures of your work!